At the age of four, Bryn watched a rogue werewolf brutally murder her parents. 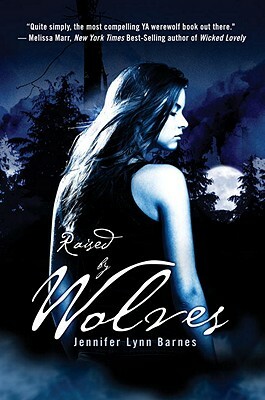 Alone in the world, she was rescued and taken in by the mysterious Callum, the alpha of his werewolf pack. Now fifteen, Bryn's been raised as a human among werewolves, adhering to pack rule (mostly). Little fazes her. But the pack's been keeping a secret, and when Bryn goes exploring against Callum's direct orders, she finds Chase, a newly turned teen Were locked in a cage. Terrifying memories of the attack on her mom and dad come flooding back. Bryn needs answers, and she needs Chase to get them. Suddenly, all allegiances to the pack no longer matter. It's Bryn and Chase against the werewolf world, whatever the consequences. An exciting new paranormal adventure, with a heroine that rivals Buffy, "Raised by Wolves" will leave you howling for more. Jennifer Lynn Barnes was born in Tulsa, Oklahoma. She has been a competitive cheerleader, a volleyball player, a dancer, a debutante, a primate-cognition researcher, a teen model, a comic-book geek, and a lemur aficionado. She's been writing for as long as she can remember, and wrote her first novel, "Golden," when she was nineteen. Jen graduated from Yale University with a degree in cognitive science 2006, and spent a year doing autism research at the University of Cambridge. She is currently continuing her graduate studies at Yale. Visit her online at www.jenniferlynnbarnes.com."